John Blozak, outfielder for the South Side police baseball team, flies out in second inning of yesterday’s opening battle with the North Siders in Comiskey park. Eugene Casey is the North Side catcher, Eddie Stack is the umpire. The South Siders won, 15-12. The South Side, led by Capt. Patrick Crotty, nosed out the defending title holders representing the North Side in the opening game of the annual Chicago Police Benevolent association baseball series in Comiskey park yesterday, 15 to 12. The winners got 18 hits, seven good for eight runs in 2 2-3 innings off McEwing Barrows of the 30th district, and 11 good for seven tallies off John Klicka of the traffic division who finished. Tony Sims of the 18th district went the route for the South Siders, surrendering 16 hits. 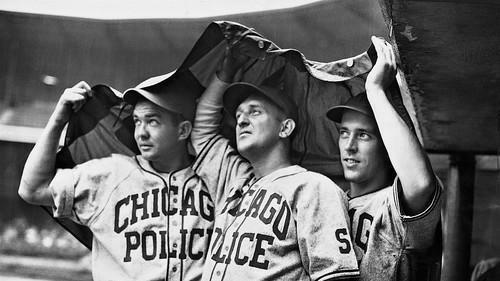 Members of the South Side Police team in rain before beating North Siders, 15 to 12, in Comiskey park. Left to Right: Raymond Duffy, Raymond Blazak, and Bernard Dailey. Titular honors among Chicago’s baseball-minded policemen were bestowed upon the south side team commanded by Capt. Patrick Crotty when they humbled the former champs, representing the north side, in 13 innings at Comiskey park yesterday by a score of 6 to 4. Tony Sims, a chunky right hander stationed in the 19th district, who hurled the south side bluecoats to a 15 to 12 triumph Saturday in the opener of the hectic annual series under the auspices of the Policemen’s Benevolent association, came back brilliantly to make it two straight. His home run blast into left field shattered a 4 to 4 deadlock. 1940 June 29 — North Side 7, South Side 1 at Wrigley Field. 1940 June 30 — South Side 14, North Side 10 at Wrigley Field. 1940 July 7 — North Side 16, South Side 2 at Comiskey Park. 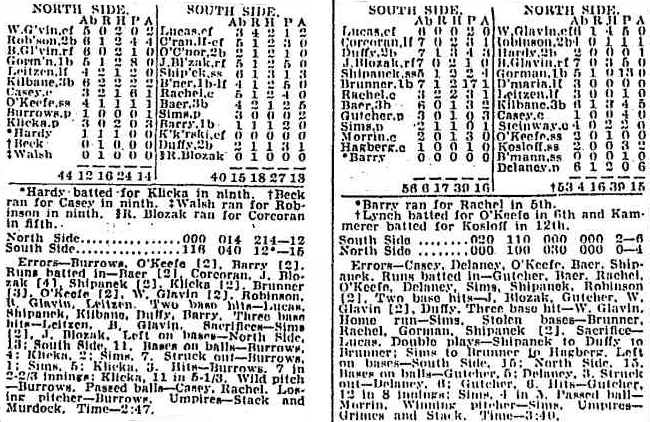 1935 July 7 at Wrigley field. 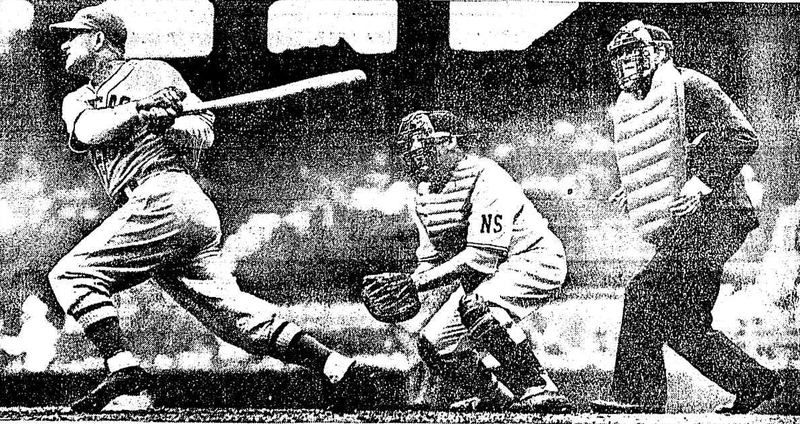 1933 September 30 at Wrigley field.